Police officers and security watch as people re-enter a building after a stabbing incident in central London, Friday, Nov. 2, 2018. Terrible things have indeed been happening in London. Hardly a day goes by without a report of a knifing on London’s streets. The number of offenses involving a knife or bladed weapon recorded by the Metropolitan Police in the first three months of this year rose to 40,147, a seven-year record, prompting rising public alarm and angry accusations that city authorities and police have all but lost control, due to government-driven cuts in policing and the budgets of local social service departments. The rise in violent crime in the last eight years in the capital has coincided with a 15 percent reduction in the number of police officers and 40 percent decline in neighborhood policing involving officers walking or driving a beat. On Monday, London's mayor, Sadiq Khan, warned it could take a generation before the tide is turned on violent crime in the capital. His warning provoked an outcry with critics saying London doesn't have a decade - if it wants to save lives, restore law and order as well as re-establish a reputation for safety. 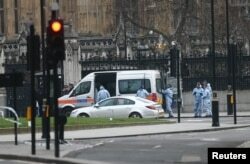 FILE - Police work at Carriage Gate outside the Houses of Parliament the morning after an attack by a man driving a car and weilding a knife left five people dead and dozens injured, in London, Britain, March 23, 2017. Many of the stabbings are gang-related, and crime analysts fear the numbers are likely to increase because of a shift in the nature and structure of the drug gangs and markets they are vying to control. Until recently, street gangs were focused on geographical territory, but now they are more freewheeling and tied less to their own streets and boroughs as they seek to maximize profits. They have also become more secretive, business-focused as well as much more ruthless. They recruit aggressively, threatening youngsters, including at elementary schools, and intimidating them to join them. “The gangs are in the schools, they are in the colleges; some people have to change schools just because there are gangs waiting outside,” said Byron Douglas-Letts, the brother of a stabbing victim. “Even if you don’t want to be part of it, you are part of it,” he told the BBC. Douglas-Letts’ brother, Lewis Elwin, was stabbed to death in 2016 just a few streets away from Sadiq Khan’s home in the south London borough of Wandsworth. The mayor attended the funeral. Elwin had turned 20 when he was stabbed in the back near an elementary school in Tooting. Lewis Elwin staggered along the street before collapsing as horrified parents were picking up their children from the school. Medics fought to save him but he bled to death at the scene. Just days before his murder, family members had warned Elwin that he was running with a dangerous crowd. “Lewis having his life cut short in this terrible manner devastated our family,” said Douglas-Letts. He says much more needs to be done to counter intimidatory and predatory recruiting by gangs. So do others, who fear that violent gang culture is seeping into youth culture generally in the capital and other big cities in Britain, with youngsters seeing it as only natural to pack knives and resolve petty disputes with a knife thrust. Half of the stabbing victims have been under age 24. Many, like Beniamin Pieknyi, weren’t members of gangs or involved in drug dealing. They were just in the wrong place at the wrong time, say police, victims of unprovoked attacks, ordinary people just going about their business, from shopping to enjoying a carefree night on the town. Ann Oakes-Odger, founder of the campaigning group KnifeCrimes.Org, which she set up after her son Westley was stabbed to death, blames the legal system for being soft on crime. “At the moment, the people involved in crime seem to be laughing at the legal system.” She wants tougher sentencing for knife crimes, arguing they would act as a deterrent. There’s mounting pressure, too, on the government from both police chiefs and law and order campaigners to expand police stop-and-search powers by lowering the level of suspicion an officer needs to frisk a suspect. They want to scrap the requirement that “reasonable grounds” are needed before a person can be stopped for a search. Britain’s interior minister, Sajid Javid, is said to be receptive to the idea. But that has triggered the concern of rights organizations about police discrimination against minority ethnic communities, civil liberties and the poor role stop-and-search played in the past when police had wider powers in actually reducing violent crime. Jennifer Jones, a member of the House of Lords and a prominent member of the Green Party, doesn’t believe expanding stop-and-search powers will have any effect in reducing knife crime. Khan points to the success Glasgow has had in reducing knife crime by pursuing early intervention measures in schools, focusing on troubled youths and gang members and ensuring coordination among police, teachers, parents and social services. But that strategy is time-consuming and labor-intensive - and it was a decade before the strategy paid off. It isn’t only in London where officials are looking for ways to reduce violent crime. Stabbing incidents have risen by a third elsewhere in Britain, especially in Sheffield, Leeds and Liverpool, which have been hard hit. Even rural areas are seeing a jump, notably in north Wales and Norfolk, partly a consequence, say police, of city gangsters expanding into towns once the preserve of small-time dealers.